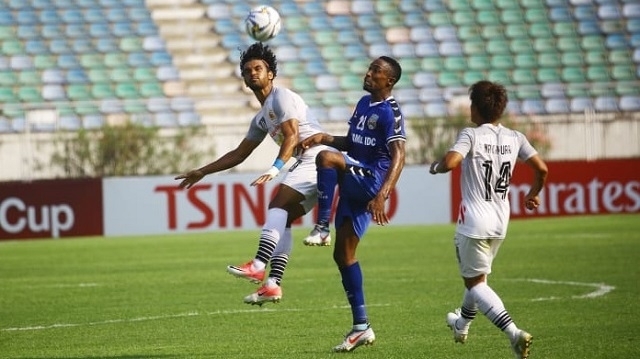 After Hanoi FC lost their first match of the 2019 AFC Cup group stage to Yangon United on April 2, another Vietnamese representative, Becamex Binh Duong, gained their first three points of this year’s AFC Cup campaign with a hard-fought 2-1 win over another Burmese side -Shan United, at Thuwunna Stadium in Yangon, Myanmar, on April 3. After the first two matches in Group G ended with a draw and a defeat, Binh Duong had a great chance to have their first victory as they only had to meet Shan United, who lost both their previous matches. Coach Tran Minh Chien’s side was determined to win the full three points to raise hopes of progressing in Group G.
However, during the first 45 minutes, the Vietnamese team proved to be rather low compared to Shan United. The home team created quite a lot of good opportunities against goalkeeper Duc Cuong, but the host players proved too ungainly, constantly missing their chances to open the scoring. Playing with a deep-lying lineup during the first half, the visitors succeeded in preserving their net in the face of great pressure from the home team. In the second half, coach Tran Minh Chien's side suddenly accelerated the game speed and quickly got the opening goal just four minutes after the break. From the left of the box, midfielder To Van Vu made a cross-pass, forcing the ball to float straight to the back post to the helplessness of goalkeeper Min Latt. Binh Duong's strikers continued to create a lot of pressure after the opener, however, striker Victor Mansaray continuously missed his golden opportunities. The wasteful visitors then paid the price after conceding in the 68th minute. Shan United's counter-attack ended with a brilliant header from Hedipo Conceicao, leveling 1-1 with still more than 20 minutes to play. The tension was maintained in the last minutes, but just when it looked like the home side had done enough to earn a point, Binh Duong struck again just three minutes to the end of the match. Min Latt's mistake in the penalty area allowed Wander Luiz to score from close range, sealing the 2-1 win for the Vietnamese side. Three important points on their away match, though not helping the defending champions of the Vietnamese National Cup to improve their third-place rankings in Group G, but will certainly help them strengthen their confidence to compete for a ticket to progress.